I don’t know how anyone reading Paul’s Letter to the Galatians and the Epistle of James can think that those two authors saw things eye-to-eye on a variety of important issues. In particular, while there is no way of knowing if this is the case, in reading the segments regarding “faith and works” in their letters it certainly feels as if one of them is responding rhetorically to the other—and, again, they don’t seem to be in agreement on the topic. Do you want to be shown, you senseless person, that faith apart from works is barren? Was not our ancestor Abraham justified by works when he offered his son Isaac on the altar? You see that faith was active along with his works, and faith was brought to completion by the works. That is the way the scripture was fulfilled that says, “Abraham believed God, and it was reckoned to him as being just,” and he was called the friend of God. Though this epistle of St. James was rejected by the ancients, I praise it and consider it a good book, because it sets up no doctrines of men but vigorously promulgates the law of God. However, to state my own opinion about it, though without prejudice to anyone, I do not regard it as the writing of an apostle; and my reasons follow. In the first place it is flatly against St. Paul and all the rest of Scripture in ascribing justification to works. It says that Abraham was justified by his works when he offered his son Isaac; though in Romans 4 St. Paul teaches to the contrary that Abraham was justified apart from works, by his faith alone, before he had offered his son, and prove it by Moses in Genesis 15. Now although this epistle might be helped and an interpretation devised for this justification by works, it cannot be defended in its application to works of Moses’ statement in Genesis 15. For Moses is speaking here only of Abraham’s faith, and not of his works, as St. Paul demonstrates in Romans 4. This fault therefore, proves that this epistle is not the work of any apostle. In the second place its purpose is to teach Christians, but in all this long teaching it does not once mention the Passion, the resurrection, or the Spirit of Christ. He names Christ several times; however he teaches nothing about him, but only speaks of general faith in God. Now i is the office of a true apostle to preach of the Passion and resurrection and office of Christ, and to lay the foundation for faith in him, as Christ himself says in John 15 “You shall bear witness to me.” All the genuine sacred books agree in this, that all of them preach and inculcate [treiben] Christ. And that is the true test by which to judge all books, when we see whether or not they inculcate Christ. For all the Scriptures show us Christ, Romans 3; and St. Paul will know nothing but Christ, I Corinthians 2. Whatever does not teach Christ is not apostolic, even though St. Peter or St. Paul does the teaching. Again, whatever preaches Christ would be apostolic, even if Judas, Annas, Pilate, and Herod were doing it. But this James does nothing more than drive to the law and to its works. Besides, he throws things together so chaotically that it seems to me he must have been some good, pious man, who took a few sayings from the disciples of the apostles and thus tossed them off on paper. Or it ma perhaps have been written by someone on the basis of his preaching. He calls the law a “law of liberty,” though Paul calls it a law of slavery, of wrath, of death, and of sin. Moreover he cites the sayings of St. Peter: “Love covers a multitude of sins,” and again, “Humble yourselves under the hand of God;” also the saying of St. Paul in Galatians 5, “The Spirit lusteth against envy.” And yet, in point of time, St. James was put to death by Herod in Jerusalem, before St. Peter. So it seems that this author came long after St. Peter and St. Paul. In a word, he wanted to guard against those who relied on faith without works, but was unequal to the task in spirit, thought, and words. He mangles the Scriptures and thereby opposes Paul and all Scripture. He tries to accomplish by harping on the law what the apostles accomplish by stimulating people to love. Therefore, I will not have him in my Bible to be numbered among the true chief books, though I would not thereby prevent anyone from including or extolling him as he pleases, for there are otherwise many good sayings in him. One man is no man in worldly things; how, then, should this single man alone avail against Paul and all the rest of Scripture? I’m pretty sure I agree with him. Despite popular and frequent statements in some Christian circles which proclaim the Bible’s “simple message,” the reality is that this ancient collection of texts is complex—as one should probably expect of any accounts and revelation of God, humanity, truth, life, etc., written by multiple authors over a period spanning two thousand years. And I don’t think if you had asked biblical authors themselves they would have said that the scriptures had a simple message, either. I think for them they would say that the Bible was full of God-breathed and revealed mystery, that at times could be clear. In this regard I don’t think it is helpful to approach the Bible with over-simplifying (simplistic) or reductionist methods which attempt to minimize, or do away with entirely, difficult issues just because they make us uncomfortable or potentially lead to difficult questions about the Bible’s unity or inspiration. My thoughts are that if we find tension, difficulties, or differences in the biblical texts that, rather than shy away from them, we should lean into and embrace them. For those who truly believe that God’s message is revealed in and through the Bible, what if attempts to minimize and/or do away with the differences in the tensions and unique voices within those texts actually cause us to miss something the Spirit of God is saying? I find that when I allow the individual and unique human voices within the Bible speak the God-breathed mystery behind it draws me even more deeply into the texts and more intently into listening for the Spirit’s voice. Who knows, maybe one of the key messages God intends for us is that the unity of those who follow Christ is more about being found united in Christ rather than how much we agree and that we can graciously pursue Him and his Kingdom together despite our (sometimes tense) differences. 1From the essay, “Justification and salvation-history in Romans” Kasemann in Pauline Perspectives, 118. Translation from the German by Chris Tilling. 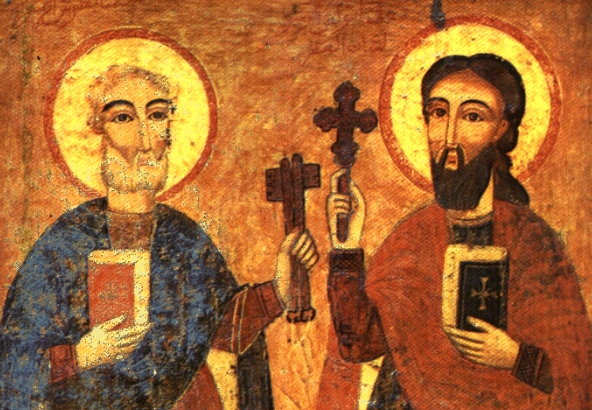 Why not actually include a picture of Paul and James, instead of Peter and Paul? Lol…I tried to find one. If you know of one, let me know and I’ll switch it out. I settled for Peter and Paul for two reasons: Paul addresses tension with Peter as well in Galatians and I thought most readers wouldn’t notice. 😉 I’m glad you did.